Nice op-ed from a 37-year veteran teacher who nails it to the wall, regarding what teaching has become–a slave to reform ed ideas. And how veteran teachers survive it. “The education reform movement has choked, stifled and smothered veteran teachers. It has poo-poo-ed their historic knowledge and the vast wealth of experience they have collected. Education reform has replaced it with ridiculous chants, mantras, beliefs and a bowing before the goddess of data and technology. A great false association has taken place. It is believed that because shiny new green teachers (the ones who quit in mooing herds within their first five years) are adept at computer usage they are also are harbingers of true new fix-it-all education. And this works for principals who desire compliant teachers to implement the new stuff. Who better to do it than flexible indentured newbies who feel indebted to the principal for employment. “Veteran teachers have seen the following elementary educational fixes. And we survived them. Well, some of us did. “MATH: Math Their Way, Math Land, Mathematics Unlimited, Callifornia Math, Excel Math, Math Expressions, Dot Math, Math Manipulatives, New Math, Common Core Math … and more. Couldn’t have said it better. And I’ve tried, believe me! I'm finding it incredible that about five seconds ago I was writing posts about teaching math to C., and today C. is taking his NY state teaching exam. Meanwhile, our house went on the market yesterday. I've been so lax writing the blog that I no longer remember how to fix the recent comments widget, or even where to find it. I'm actually planning a Whole New Blog, with a good friend, but since it's not up yet, I'm still planning as opposed to announcing. C. (studying for teacher exam): I hate geometry. Me: Then you should probably do some geometry. It's good for your brain. Me: I don't care if you hate geometry. You should do some more. Me: You know I don't care if you hate triangles. You remember I'm a person who doesn't care, right? This exchange was more fun than it sounds. Lots more fun, in fact. C. is actually enjoying himself (though he's not enjoying geometry). He's told me, several times now, "I like algebra." I'm sitting in the kitchen, C. in the dining room, and I'm hearing "I got it right!" C. asked me to help him with the triangle problems. I said I would. Then I didn't. He helped himself. Consciously, I intended to help, but .... I didn't get to it. This is yet another case where I think parental instincts work well and ought to be respected. Then, when C. went to high school, I bowed out. Of course, the reason I could bow out was that we had pulled him out of our public school district and sent him to a Jesuit high school. The one and only time we had a significant problem there, with one particular teacher, Ed handled it. My mother was sick at the time, and I was flying back and forth across the country, so I don't know what I would have done if that hadn't been the case. Nevertheless, the point remains: I was a helicopter parent up through 8th grade, then I wasn't. C. graduated from NYU last week and starts his NYC Teaching Fellows program mid-June. He takes the teacher test this Thursday. Today, when he asked for help with triangle problems, my cognitive unconscious apparently decided he didn't need help. And he didn't. So now I'm a hands-off parent and a constructivist. This is the correct trajectory! The correct, time-honored trajectory, may I add. Treat children like children, treat grown-ups like grown-ups. An 11-year old doesn't need to teach himself, and shouldn't. A 22-year old does need to teach himself and must. And the best way to become a self-teaching 22-year old is to have teachers and parents who directly teach you when you're 11. People have known this for hundreds of years--thousands of years--and yet our public schools have somehow forgotten. Another thing: all the give-your-child-the-gift-of-failure advice bestowed upon parents of middle school children is wrong. Knowledge is a gift. Teaching your child reading, writing, arithmetic, history, science, literature: that's the gift. While I'm on the subject, grit is wrong, too. Give your child the gift of failure, then he'll have grit --- no! C. is now 22 and guess what? He has grit. At least, he has as much grit as any other 22 year old, which is as much as he needs at this point. Today C. is responsible, he's independent, he's a serious person, and he's launched. He's exactly where he should be at 22. C's friends are all in good shape, too, and none of them was ever "given" the gift of failure. When they experienced failure, the "gift" came from bad curriculum and bad teaching, and the parents responded with private tutors and personal reteaching at home. All of the parents we know protected and taught their children, and today those children are brand-new adults in good standing. This brings me back to my long-time view that schools and governments and ed reformers and all the rest of the merry band should spend more time listening to parents and less time listening to themselves. We parents may not always know what we're doing, but we're on the ground, and we're not crazy. And we care. We don't just want to get it right, we have to get it right. Our kids' lives are our lives. One of my favorite KTM lines, from Steve H, was (from memory): "Parents make mistakes, but it takes an ed school bureaucrat to really screw things up." Anyway, I must get back to revisions and packing. Ed and I did everything the authorities told us not to do, and our son is a terrific young man as a direct result. P.S. Just to be clear, I actually do care whether C. likes geometry. I would like him to like geometry. I don't care that he doesn't like studying geometry for a certification test. As a matter of fact, I'm glad he has to study geometry for a certification test, whether he likes it or not. I felt the same way about the SAT. P.P.S. Side issue: is it good to be 'rounded'? If you're a verbal person, not a visual person, is it good to do some geometry (or drawing)? If you're an academic type, is it good to play sports as well? I can't tell, and I've read research supporting building up your weak skills as well as research supporting focusing on your strengths and not building weak skills (because inside the brain, skills compete). Intuitively, I always feel that you don't want to be completely one thing and not another, but I have no idea whether that's right. Maybe I'll develop a bona fide attachment to a baseball team one of these days, as opposed to the weak-kneed attachment I currently have to the Chicago Cubs. It's never too late. Camille Paglia's essay Free Speech and the Modern Campus is well worth reading. In it, she makes a point Ed has made any number of times: the real source of illiberal speech codes and suppression of dissent lies in the various interdepartmental "studies" programs that were set up in the wake of the 1960s. When we talk about remedial courses, we usually talk about community colleges, where more than half of students take them, and where they pose a significant barrier to graduation for many. But a new report from the advocacy group Education Reform Now and the advocacy publication Education Post broadens the lens. According to their analysis of state and federal higher education data, 45 percent of students who place into remedial courses come from middle- and high-income families. That describes Diaz, who attended private school in the affluent Sherman Oaks section of Los Angeles. This was what Michael Dannenberg, a co-author of the report, calls a "whoa" moment: "realizing that students from all income backgrounds are suffering the consequences of mediocre high schools." How is this a "whoa moment"? How is this a "whoa moment" for the co-author of a report on US education? I blame No Child Left Behind (a law I supported and still do.) All of the language surrounding NCLB implied (and assumed) that white schools were good, black schools bad. The injustice was happening to just one category of student. That was always wrong, but it stuck. Matthew Tabor has just posted a video called "Common Core Explained" on The 74. I love The 74 -- they (generally) do an outstanding job, with news and opinion worth reading. I read all of it every day and point people to their perspective whenever I can. However, the appropriate academic term for this Math 2.0 video series is "absolute horseshit." In the first minutes of "Math 2.0," we learn that "Common Core math" teaches children to subitize. "Subitizing" means you see 3 pennies and immediately know you have 3 pennies. You don't have to count. Subitizing, as it happens, is an innate ability. Chimpanzees can subitize, too; in fact, chimps do it better than humans. They can subitize up to the number 6. We stop at 5. I'm pretty sure I remember that all creatures can do it, but I'm not going to spend 15 minutes Googling "Can goldfish subitize" to find out. Another thing: I'm having a hard time believing that formal instruction in subitizing is part of the Common Core, but I'm not going to Google that, either. I need an island get-away. 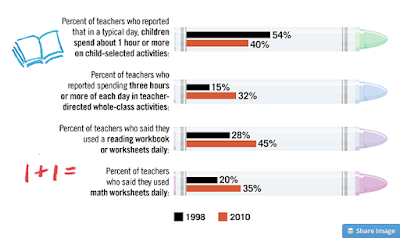 Is Common Core increasing direct instruction? I don't know the answer to that question. I'm asking. My new copy of Education Week has a front-page story titled "Will the Common Core Step Up Schools' Focus on Grammar?" I find that interesting (I have yet to read) because I'd been wondering the same thing about direct instruction after seeing the graphics in Ed Week's story Kindergarten Today: Less Play, More Academics. By the way, I have no particular position on Kindergarten on way or the other. In my day, Kindergarten was .... well, what was it? I remember sitting at tables with other children, going out to recess, and sitting on the rug to listen to show and tell. We didn't learn to read. Siegfried Engelmann taught academic skills to pre-school children, which served them well, so I'm certainly not against direct instruction in academic skills at that age. My point in posting is that this looks to me like a significant change in the direction I definitely want to see for first grade and up, and I wonder how real, and how widespread, this change is. My own district is all constructivism all the time now. WHEN Louisiana State University fired a professor in June 2015 for using rude words in a class designed to prepare teachers for careers in inner-city schools, it was an early skirmish in a conflict between students (one of whom had complained) and faculties over free speech that has since spread across the land. The university’s faculty is now considering something that others in the same position have done: copying the University of Chicago. In response to a number of universities cancelling invitations to controversial speakers and challenges to academic freedom, Geoffrey Stone of Chicago’s law school was appointed chair of a committee that would restate its principles on free speech. The statement was issued a year ago, shortly before the murderous attack on Charlie Hebdo, a French satirical publication, for its cartoons of Muhammad. Since then the debate over permissible speech on college campuses has only become more contentious. A website, thedemands.org, lists speech-curbing demands from students at 72 institutions. Administrators are tying themselves in knots in an effort to balance a commitment to free expression with a desire not to offend. One consequence of this has been to call attention to the Chicago Statement, which has been adopted by Purdue, Princeton, American University, Johns Hopkins, Chapman, Winston-Salem State and the University of Wisconsin system, according to the Foundation for Individual Rights in Education (Fire), a pro free-speech non-profit which is actively promoting it. It is brief (three pages) and emphatic. “It is not the proper role of the university to attempt to shield individuals from ideas and opinions they find unwelcome, disagreeable, or even deeply offensive,” it states. “Concerns about civility and mutual respect can never be used as justification for closing off discussion of ideas, however offensive or disagreeable.” The responsibility of a university, it concludes, is not only to promote “fearless freedom of debate”, but also to protect it. The committee gave much consideration to concerns about “hate speech” and “micro-aggressions”. Whatever harm such expression caused, it concluded, should be redressed by “individual members of the university…openly and vigorously contesting the ideas that they oppose,” rather than by censorship. The widening adoption of the statement came as a surprise, says Mr Stone, because it was built upon the college’s own history, including a controversial invitation by students in 1932 to William Z. Foster, then the Communist Party candidate for president. The proper response to unpopular ideas, responded then-president Robert Maynard Hutchins, “lies through discussion rather than inhibition”. In 1967, during protests over civil rights and the Vietnam war, and demands that the university itself should take a stand, a faculty committee chaired by Harry Kalven, one of Mr Stone’s professors, concluded that would be wrong: “The university is the home and sponsor of critics; it is not itself the critic”. From what I can see, suppression of speech on campus is as bad as it looks; nothing I've read in news accounts is exaggerated. So I'm rooting for the Chicago statement. The campaign in Iowa performed its usual task of starting the long process of winnowing out the presidential field, but it failed to fully resolve this year’s underlying mystery: Why are voters toying with radical change at a time when, objectively speaking, the country isn’t in bad shape? "Objectively speaking," this time is different. 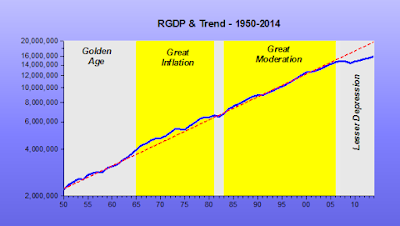 This time, the country didn't recover from the recession. 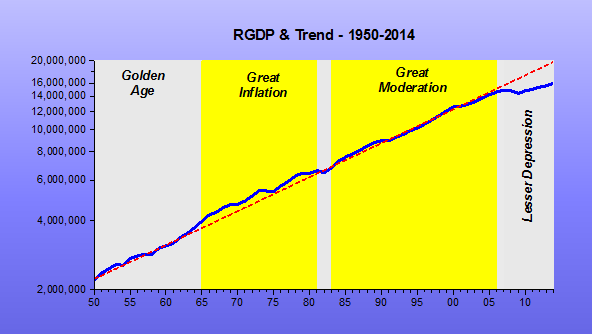 In every other recession of the 20th century, including the Great Depression, economic growth went back to trend. Yet only the people seem to know it. *Perhaps the 19th century as well -- I don't know the history. I'm watching the Iowa caucuses on CNN ... and the announcer is in Coralville. Setting aside the mischief this is going to do, how many "adult geniuses who change the world" do we actually need? And how often does a lone genius change the world? Should all expert physicians "fight to fix a broken medical system"? As to the rigidity of experts, which is a real phenomenon, the solution isn't to get rid of experts. Barry Garelick to speak at researchED! Debbie and her daughter Daisy are writing a book! "9-minute read" - "Recovered or not"
I've mentioned several times that I became a macro aficionado after the crash -- a macro aficionado and a Fed watcher, heaven help me. d) are the parents of children who have jobs, don't have jobs, or will need to get a job one day. I've just come across this "9-minute read" from Third Way, and I think it may be the best I've seen. I say that as a person who has read approximately a gazillion articles, studies, blog posts, and white papers on the subject of unemployment in the wake of the Great Recession at this point. According to Third Way, depending on how you measure unemployment, we are either nine-tenths, two-tenths or just over halfway to a full jobs recovery. Recovered or Not: What’s Really Happening with U.S. Unemployment? Meanwhile the Hamilton Jobs Gap Calculator says we are still 2.5 million jobs short. Is math by hand better than math by keyboard? The actual process of using your muscles to write something is a powerful long-term memory aid. The more that you write out things (and in different ways), the more your long-term memory will be etched out. It is not good enough simply to read and think (although this is important for reviewing large amounts of material shortly before taking an exam, but only if you have done the long-term ground work). Writing out full solutions to problems in math is especially important compared to other subjects, whether it is part of reviewing for exams or whether you are learning new material. Writing things out can also help you to understand difficult problems. For example, if you see a fully worked solution to a problem in a textbook, but don't understand one or more of the steps, try simply writing out the solution yourself. You may be surprised that while you are doing that, you suddenly understand something that you didn't before. Sometimes the brain has a strange way of working. Despite its enormous capacity , the. brain can really benefit from an external "scratch pad." When you come across something that you don't understand, sometimes just writing out the steps in a brief form can make a great deal of difference. I've always found this to be true, both for C. and for me. I don't know why. One of these days I'll get around to reading The Hand: How Its Use Shapes the Brain, Language, and Human Culture, which I hope will explain the phenomenon. 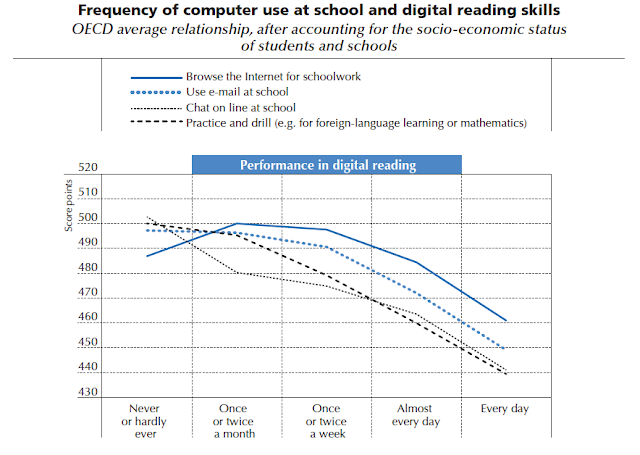 The decline in performance associated with greater frequency of certain activities, such as chatting on line at school and practicing and drilling, is particularly large (Figure 6.6). Students who frequently engage in these activities may be missing out on other more effective learning activities. Students who never or only very rarely engage in these activities have the highest performance. 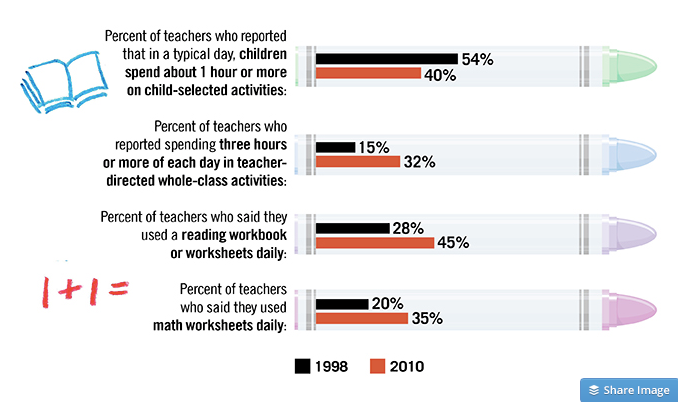 Given my experience, the "other more effective learning activities" these students are missing may be drilling by hand.